Stella is an English teacher from China. We had an interview with her about her experience in using Edraw. Shown below is the transcript of Stella's story. I used to present my teaching contents in PowerPoint. It can meet most of my needs. But I have to search the Internet for pictures or clipart when I want to visualize my ideas. Edraw really helps me in terms of visualizations. I clearly remember my students' feedback when I first used Edraw visuals in my class. They adored the diagrams I used, which could impress them and help them memorize better. They even told the leader that I am "the most satisfying teacher" they ever met. I believe that one person's biggest enemy is himself because he needs to fight against his own shortcomings to be successful. So, in my first class, I often ask students to analyze themselves and find out their strengths and weaknesses in learning English. I have found one very suitable example, a mind map. I make some changes. 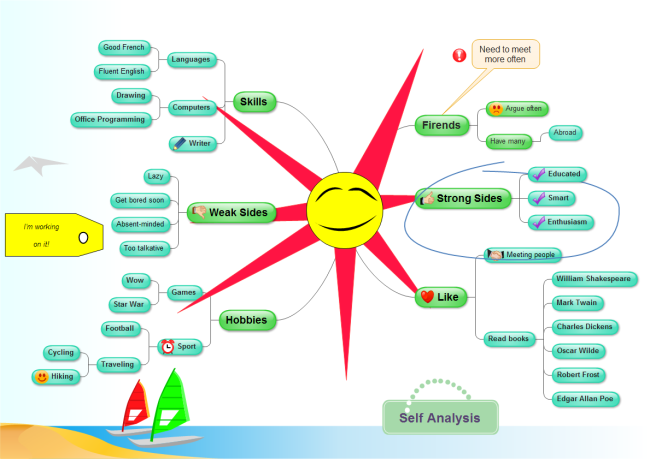 It really amazes me and students are attracted by the mind map. My students often ask me how to learn new words, especially boys who are not very good at languages. 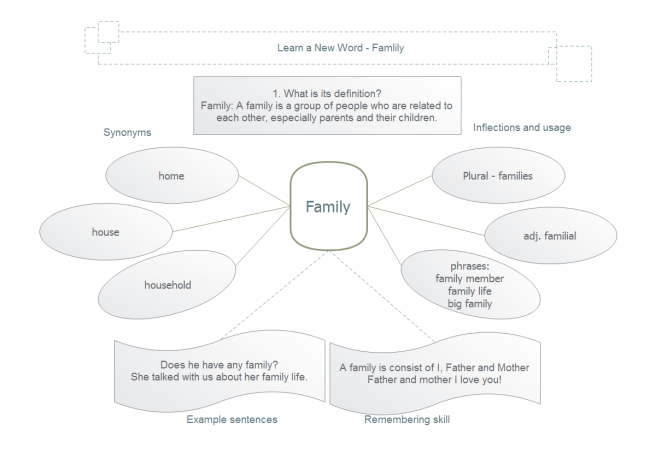 Therefore, I design a diagram about learning new words visually. Accompanied with a CCTV's public service advertisement of family, students mastered the word "family" better. 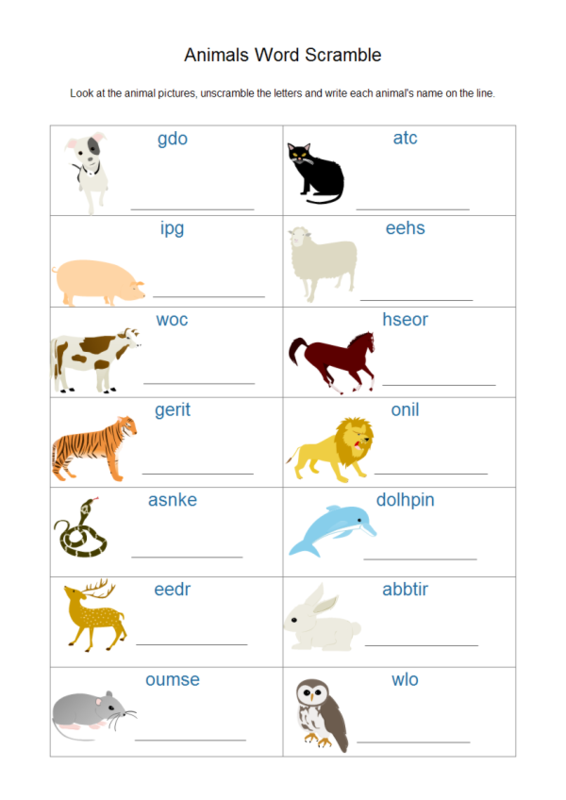 Inspired by Edraw's flash cards, I have also made some to aid my vocabulary teaching. It is really convenient. I never expect to gain infographics so easily. I just need to drag and drop shapes. It is a whole lot easier and faster than downloading pictures online and then inserting them into slides. Compared with PowerPoint, Edraw's shapes are more flexible. In PowerPoint, I have to add shapes and text boxes separately. As a result, I have to adjust the size of shapes and text box again and again to make them fit together. Edraw solves this problem very skillfully. Most shapes are attached with text box. Once the shape is resized, the text box also changes. I also adore Edraw shapes' auto connection features. They have connection points. And I can even add more connection points to them. In this way, I can show relationship between different ideas quite easily. Talking about my advice, I really hope that Edraw can include more education templates and examples. And I think the clip art amount is also limited. The more subjects it covers, the better. In a word, Edraw really saves me time and energy in class planning. The infographics are one of my best aids. I strongly recommend other teachers to apply these kinds of diagrams. Finally, I wish Edraw greater success. See another user's story and find out how visualization can make life easier and funnier. A story about using visuals to share ideas and help others.